The island of Iceland sits between Greenland and the rest of Europe. This Nordic country also happens to have an abundance of geothermal energy, wind power and hydropower. Glacial melt water helps Iceland to generate more than 12 gigawatt hours of electricity, which is five times what the population demands. This fact has caught the UK’s eye. Over past years, Britain has increased its use of wind power as a part of its electricity generation; however, these efforts have proven to be rather unpredictable. According to an article by Simon Bowers published inThe Guardian, the UK’s electricity supply won’t be enough for future demand, and therefore the risk of blackouts is expected to rise by 2015. In lieu of this, an energy project between Iceland and the UK is in the works. 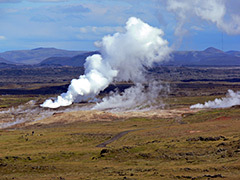 The UK wants to offset its energy supply with some of the energy Iceland is producing. To do so, they are going to build a £4.3bn subsea electricity cable that links Iceland to the UK’s electricity grid. This cable would be 1,000km long— the longest in the world. Just how much energy would be transported from Iceland to the UK? They are looking at delivering five terawatt-hours a year to Britain. That’s enough to power 500,000 homes for a whole year. The cost of using Iceland’s energy would be 15 percent lower than using Britain’s offshore wind. Even so, someone has to pay for the construction of the cable. That somebody is looking like it will be the British taxpayers. Once the details are hammered out, the official contract will be put in place and work can begin. Posted on November 7th under Geothermal Energy.